“The history in a sense is the holy book of peoples: the main, necessary; the mirror of their entity and activities; book of revelations and standards;behest of ancestors to the posterity; supplement, explanation of the present and an example of the future”. He finished his work with Volume XII, Chapter V. Inter-reign. 1611-1612. Since then there were made many attempts to describe the history by many authors, Russian and non-Russian. In front of me lies the book “A People’s Tragedy” by one of the best modern British writers, Professor of History Orlando Figes, who writes about Russian all his life. He is a unique author who twice happened to be in the shortlist of the main English Literature prize of Samuel Jonson for non-fiction in 2003 for the book “Natasha’s Dance. Cultural History of Russia” and in 2008 for the research “Whisperers: Private Life in Stalin’s Russia”. For the book “A People’s Tragedy” Figes got five different Literature prizes. Not a single book of his came out in Russian, albeit many of them were translated to more than 20 languages of the world. 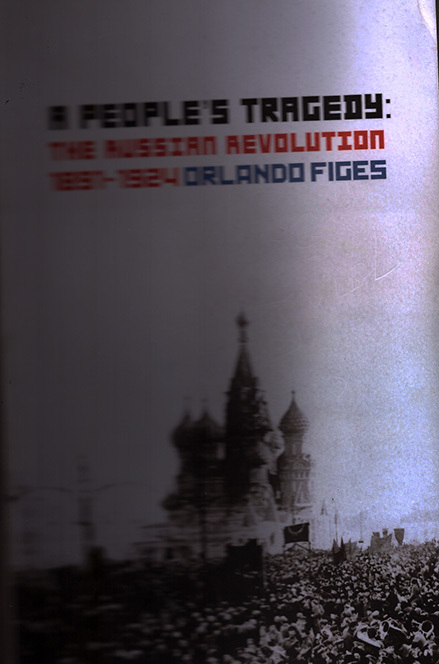 Figes very likely knows more and better than anybody else about the relation of the Russian people to the history of their own country. He gave an interview to the magazine “Snob” in London one week after the Russian President Dmitry Medvedev call the UN to join the fight “About Falsification of the History”, and one month after the first time in Europe commemoration of “The Memorial day of the Victims of Nazism and Stalinism”. One of the main subjects of the book “A People’s Tragedy” – this is the story about that how starting since July 1917 Lenin did all possible to start the civil war. He considered that the civil war is nesessary for the revolution. However there is still an expression model: “Lenin – good, Stalin – bad”. It’s wrong. Both leaders are equally responsible for bloody consequences of the revolution, including Trotsky ilk others whom Lev Davidovich mentioned in his book “The History of the Russian revolution”, 1931. It’s very pity that till now there is no decent Russian historian like Karamzin who would dedicate all his life to the description of the history of the Rossiysky state continuing from 1611-1612. 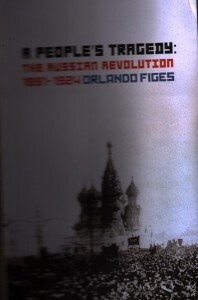 As for Orlando Figes, we just express our sincere gratitude for his great work and attempts to understand the Russian history, for that he helps to broaden our outlook and panorama of events through the personal perception of such heros as Brusilov, Prince Lvov, Gorky (Peshkov) and others.